The City of Muskogee Board of Adjustment denied a local small businessman's request to allow towing services under the E-1 Local Commercial zoning classification. Chris Fulton, owner of Bargain Wrecker Service, purchased a building at 620 South Main Street in Muskogee last November, with the intent to run his towing service out of the facility. The building had previously been used as a storage facility for a concrete company. But, problems arose when an employee parked his car on the grass outside the building; vehicles must not be parked on the grass, per city ordinance. Someone complained to the city, and Fulton was cited for illegal parking. City Planning Director Gary Garvin then informed Fulton that his facility was not zoned correctly for a towing service. Garvin said that the property would need to be zoned F General Commercial. For clarification purposes, here are the definitions for E-1 Local Commercial and F General Commercial. E-1 Local Commercial is defined in the city ordinances as "intend[ing] to provide for the conduct of retail trade and personal service enterprises to meet the regular needs and for the convenience of the people of adjacent residential areas." Some of the 73 examples listed in the city code as falling under the E-1 label include antique shops, appliance stores, laundromats, pawnshops, and used car lots. The ordinance further states that "no article or material shall be kept, stored or displayed outside the confines of the building." F General Commercial is "intended for the conduct of general business to which the public requires frequent and direct access, but which is not characterized by either constant heavy trucking other than that which is necessary for stocking and delivering of retail goods or by any nuisance factors other than occasioned by the congregating of people and passenger vehicles." Examples include bakeries, blacksmiths, cabinet shops, electrical transmission stations, mini-storage units, and sign shops. 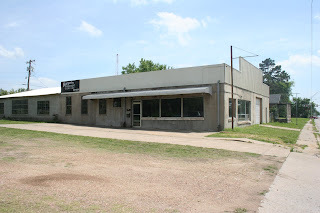 Therefore, under the current E-1 zoning, Fulton would have to park the towed vehicles inside this building, something that he has stated he would do. He estimates that the facility could hold up to 25 cars - more room than he currently uses. Most of the towing Fulton does is related to road-side assistance/insurance and impounded vehicles. A very small percentage of his work is wrecked vehicles (Fulton stated that 90% of his income was from the road-side assistance and insurance jobs). Per Gary Garvin's instruction, Fulton and his attorney, Steve Scherer, attempted to have his property rezoned F General Commercial. Most of the area surrounding the building is E-1 Local Commercial, although a few of the nearby businesses are F General Commercial. The Public Works Committee of the City Council deliberated on the issue on April 7th. Councilors Raper and Ritchey were the most out-spoken opponents of the rezoning. They opposed it on the grounds that rezoning it F General Commercial would open up the possibility of other types of businesses coming in if Fulton sold the property down the road, as well as the fact that F General Commercial doesn't fit into the Future Land Use Map for the area enacted by the city in 2003. Raper said that several citizens, as well as an official with Downtown Muskogee, Inc., had called in opposition to rezoning. Robert Perkins, David Ragsdale and Bob Luttrull were in favor of rezoning. All three councilors mentioned that the South Main area has changed very little over the past thirty to fourty years - other than vacant, dilapidated buildings being torn down. Jim Ritchey moved that the rezoning be denied, with Shawn Raper seconding. Ritchey, Raper, James Gulley and Jackie Luckey voted in favor of the motion; while Perkins, Ragsdale, Luttrull and Mayor John Tyler Hammons voted against. Since it ended in a tie, the issue was sent on to the full council meeting on April 13th. Councilor David Jones was absent, causing the tie. At the city council meeting on the 13th, after another lengthy discussion, James Gulley moved to deny the rezoning request, with David Jones seconding. Councilors Raper, Ritchey, Gulley, Luckeyand Luttrull did not change their vote from the Public Works meeting - Perkins and Hammons flipped, and Ragsdale abstained. Thus, it went from a 4-4 tie to a 7-1 denial. Failing at the council, Fulton had one other option: appeal to the Muskogee Board of Adjustment for an exception to the E-1 Local Commercial zoning, allowing him to operate his towing service without rezoning. Fulton didn't have any better luck with the Board of Adjustment this afternoon. Members Janey Boydston, Linda Carter, Carter Bradley and Jim Eby upheld Gary Garvin's ruling that a towing service does not fall under E-1, while Gary Dunlap was the only member to vote in favor of allowing it (Earnie Gilder was not present). Fulton said that he already spent thousands of dollars cleaning the property up, filling several 10-12 yard dumpsters with trash and debris from the facility. The tone of the Board of Adjustment meeting was very negative on behalf of the board members. Fulton said many times that he would store the towed vehicles inside the building, which had ample room, but Janey Boydston and Jim Eby continually stated that they did not believe he would. Steve Scherer, Fulton's attorney, had to repeatedly state throughout the meeting that he did not feel, from a legal standpoint, that the Board could deny Fulton's request on the assumption that he would not follow the rules. Whatever happened to innocent until proven guilty? Here, in the midst of a recession, the City of Muskogee is more concerned about how the entrance to the city looks than economic output. South Main is not the main thoroughfare into town, and has always been very tacky. Nothing new has gone into that area for decades, and most of the buildings are in very bad shape. Rather than allowing a young small businessman to turn a vacant building into something of economic worth, the City Council, and the Board of Adjustment, would rather let the facility rot. And again, Fulton's vehicles would be parked inside the building, rather than outside, eliminating the eyesore potential. "Now I'm $80,000 in debt, with a building I can't use." Fulton said when I interviewed him. Asked whether he would continue to pursue the matter, Fulton said, "Oh, yeah. I ain't stopping yet. I'm a fighter, man, I don't ever give up."